On August 10th, 2009, Canada Post will begin issuing a new series of stamps commemorating various sports invented by Canadians. 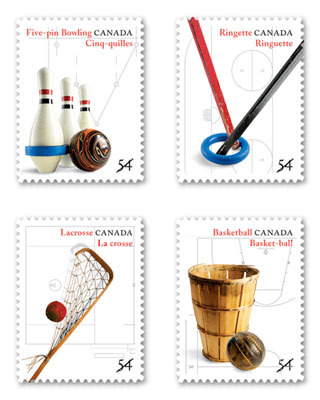 The four stamps will feature five-pin bowling, ringette, lacrosse, and basketball. These stamps will feature illustrations of the equipment used in each sport, plus a faint background drawing of the playing field for each sport. Five-pin bowling: Five-pin bowling owes its creation to the complaints of members of a Toronto bowling club who found the original ten-pin ball too heavy. Thomas F. Ryan developed a smaller ball and the pins to go with it, along with a new scoring system. Officially introduced in 1909, five-pin bowling celebrates its 100th anniversary this year. Ringette: Invented by Sam Jacks in 1963, ringette was designed to be an on-ice sport for girls and women which combined the speed of hockey with the strategy of basketball. Still played today, ringette teams count a membership of over 50, 000 worldwide. Lacrosse: Europeans only began playing lacrosse in the 1800’s after seeing it played by the Native American tribes who originally inhabited this land. In 1867, George W. Beers published a set of rules for the game and in 1994 lacrosse became Canada’s national summer sport. Basketball: Invented by James Naismith, basketball is now an international phenomenon. In the beginning, a peach basket with the bottom popped out was used to catch the ball, which then had to be removed by poking through the basket hole with a broom handle.